After carrying out a healthy market research Wirelessemporium communicated with No-Refresh to integrate a sturdy online custom designing tool towards making ease of their users to design eye-catchy skin for smartphone and laptop. The technically proficient & sizable team of No-Refresh conferred together and introduces a robust custom made skin designing tool that is very easy, affable and expedient to employ and create a new definition of skin designing with No-Refresh in support of additional aspects to include desired text, images/photos and others that literally produce fad among various users. Wirelessemporium is an excellent one-stop solution e-commerce site that deals in mobile phones, smartphone, skins & protectors, pouches & carrying case and other accessories. Integrated online skin designing tool is the foremost achievement and caters skins of high-quality images, designs, textures of your own choice at your door step. The wirelessemporioum seeks to endow with your favorite mobile phone or smartphone embellished with colorful skin transforming an exclusive look and appearance. The company wished to integrate such kind of tool where users can design skins for their mobile phones or smartphone online in very easy and convenient way by including text, image, and graphic of their own choice and customized them accordingly. In the mean time, they could make order and get their beloved product embellished with their own skin design at their shipping address. Also, they wanted to implement an exclusive eye-catchy website design that drags and keep the users engaged as well as vigorous and secured payment gateway. Our technically proficient team conferred repeatedly with the company's personals and authorized people to carry out their requirements and needs they wish for. Later, towards the same endeavor we put our best efforts to create exclusive design on the whole and integrate the application including other necessary solution. In addition, we counseled for flawless customization of product, deals etc. We transformed the web-platform ASP and employ PHP, MySQL & Flex to congregate unique design, smooth and affable navigation and vigorous performance. After absolute upgradation gradually this online shopping site goes up and ruling the skin designing market. In very short period they observed healthy volume of conversions. With integrated online skin designing tool users opt to design skins of their own choice in lack of additional efforts & skills and get to embellish their smartphone or mobile phone. The integrated online skin designing tool flaunts on an exclusive and easy to follow step by step instruction to possess their desired skins. It caters very expedient user-interface with easy functionalities. 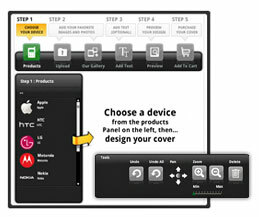 It incorporates approx all flagship brand and notorious models to select as users device they wish to design the cover. Later, it offers complete liberty to upload their favorite photos and images as well as text too. While designing the incorporated objects and texts can be customized by users in respect of text formatting, font size, color etc. and sustained other editing aspects includes Undo, Undo All, 4 way Pan, Zoom In/Zoom Out, Delete in the design area flawlessly. The user can get an entire preview of their design prior to purchase directly through this site by secured payment gateway and get delivered at their door step.